Many Mexican markets, farmers markets, and some natural food supermarkets carry prickly pears, but you can find these mostly in California, the Southwest and Mexico. You can imagine my excitement when I saw these prickly pear fruits at our produce place as it is not easy to find them here in PA and without any hesitations I grab a few of it. It cost me quite a bit of money too. Here is what I made out of the beautiful fruits. The juice of this pear gives a really beautiful pink color to the batter but after baking it kind turn into bright orangey color. 1. Cut the prickly pear into halve. By using a spoon scoops out all the flesh. Put it in a food processor and give it a few pulses. Strain out the juice to get rid of the black seeds. Set it aside. 2. Pre-heat oven to 325 degree F. Sieve all the (A) ingredient in a mixing bowl until well combined. Mix ingredient (B) until well blended and then add in ingredient (A) and mix until smooth. Set it aside. 3. Whisk ingredient (C) in mixer over high speed until stiff peak. It should not fall out when you turn the mixing bowl over. Fold 1/3 of the egg whites into the egg yolks mixture and continue to do so until egg whites is finish. Remember to fold in gently until well mixed. Note : Be warned though, while the ones in markets have been cleaned of the tiny hair-like thorns, the ones fresh off the cactus plant are covered with them, so be sure to handle them with heavy leather work gloves and scrub them hard to ensure all the painful little barbs are off. Also the juice might stain your clothing too. Either way, please handles them carefully. I want to wish eveyone a very Happy Thanksgiving and hope you all have a wonderful time with your family and friend. I've never seen this before and this pear looks pretty. I saw these before. There are lots of them at my neighbourhood but never thought that can be eaten! Are these considered as fruit? They will turned green when mature, right! Very pretty fruit! Happy Thanksgiving! It's so easy to consume, just like dragon fruit. This is the first time I heard of this fruit and have never seen it before too! Thanks for introducing it to us and happy thanksgiving! this is the first time i ever heard of this fruit! its really exotic! happy thanksgiving! This is the first time I have seen/heard about this fruit. :) Interesting!! Nice chiffon too! I see, so it was a pear chiffon huh, sound interesting. My 1st time seen this kind of pear.. I would never have guessed it in a million years! Especially since I have never come across this pear before. :P Happy Thanksgiving Gert!! i've just watched a Taiwanese program featuring Italy this evening & it showed the cactus with this fruit everywhere in Sicili & it is edible. what a coincidence! I've eaten prickly pears in Morocco where the vendors wear gloves and peel them, and sell each for about 10 cents. They are very sweet. I have purchased them here in the US and put them in my juicer to blend with other fruit juices. The prickly pear looks interesting! Doubt anyone guessed it right. so interesting! thanks for sharing. wondering malaysia got this kinda fruit onot. Such an interesting fruit! The orange hue makes the chiffon cake look so yummy! haha though I guessed pear, I missed it since it's this special kind of cacti..looks like a lovely chiffon cake though! Lisa, the one I bought they all clean of torns. So easy to handle. Kristy, I never knew either until I live here in the US. Plenty of it in the West Coast. Yes, Wendy guess correctly. Reese, maybe cold storage might have it since they sell a lot of imported fruits. 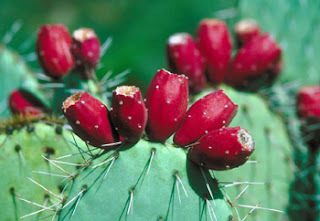 Sonia, this is cactus fruit. Bee, you didn't see any of it when you were living in CA? I know there are plenty there. Kinoko, maybe you can check out Cold Storage since they sell lots of imported fruits. Food For Tots, yes it changes to orangy color after baking. I learned something new today and what a beautiful chiffon cake! I have never seen these before and I love the colour! In. Illinois, they start green and turn deep orangey-red. The plants paddle shrivel up in the fall but the plant is not dead. Rather, it gets a new start in the Spring, plumps up, and gets covered with new beautiful yellow flowers with orange tints. Then comes the green fruit which eventually turns red. I puréed mine to add to other juice. But how do you get the membrane-like consistency to be less membrane-like?